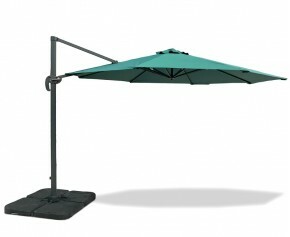 These 3.5m parasols are practical, stylish and come in a range of colours to suit any space or style of garden. Featuring vented canopies and a durable pole, these pub parasols have been designed to last for years to come making these summer parasols ideal for deployment in pubs, restaurants and gardens. Suitable for trade and retail purposes. Tropical sunshine is no match for this practical yet stylish octagonal 3.5m outdoor parasol. Expertly constructed in sustainable FSC eucalyptus hardwood complimented in a hand rubbed teak coloured finish for extra durability and aesthetic appeal, this octagonal 3.5m outdoor parasol features a new and improved heavy-duty 48mm shaft.